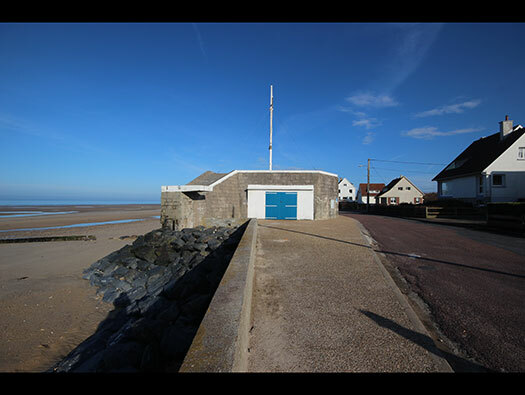 Wn33 Ver-sur-Mer, K.V.U. 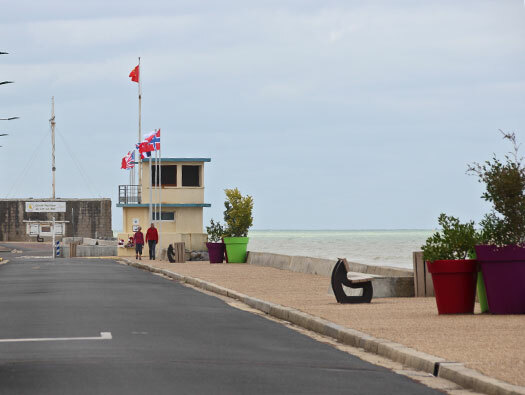 Gruppe Courseulles. 2 x Nr.1694 ringstands, one open and the other had a lid. 1 x 8.8cm Pak 43/41. 2 x 5cm KwK L/60. R669 casemate for an 8.8cm Pak 43/41. Nr.1694 ringstands for a 5cm KwK. 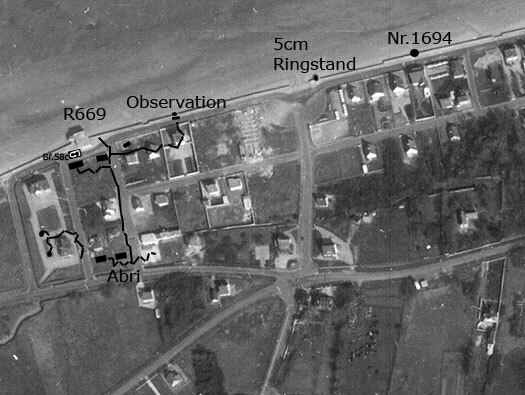 A 1960 air photo showing a lot of reconstruction and I have added where the defences were. 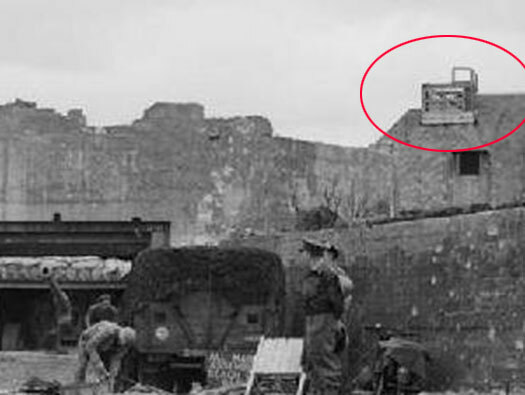 If any houses remained before D-Day they would also have been defended with infantry positions and liberally added with concrete to strengthen the positions. 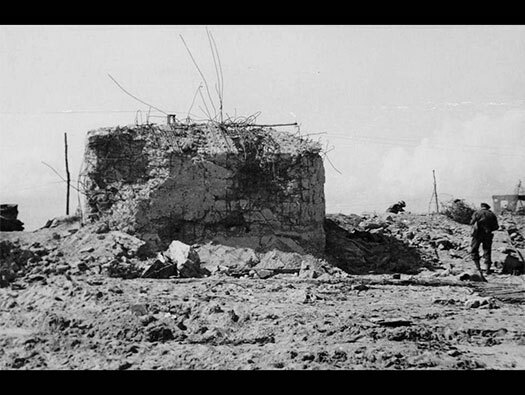 There were trenches connecting several positions together. The second Ringstand where the lid has been removed now..
Abri/Feldmässig a possible design of a small two roomed shelter that may have been used here. Plan of the 5cm ringstand from DEFE/487. 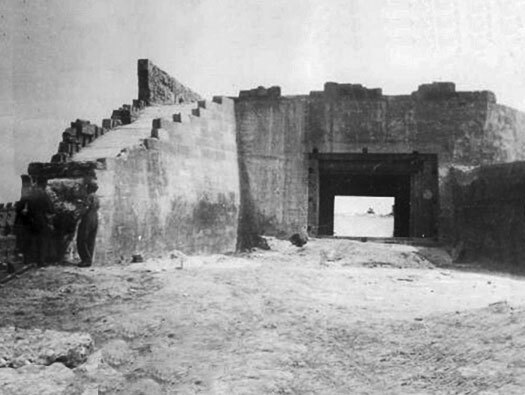 Allied COHQ Bulletin Y/33 Enemy Defences and Beach Obstacles. 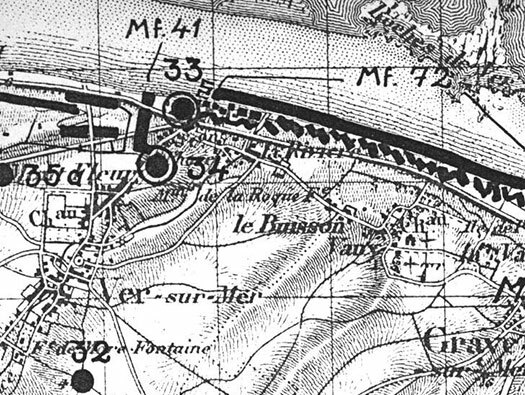 An Allied plan of the area showing what they thought were the defences. Nr.1694 ringstand for a 5cm KwK L/60 covering the right flank of the defence. Nr.1694 ringstand for a 5cm KwK L/60. I am not sure but I think this is the ringstand. Nothing remains of this position. Plan arrow is the direction of view. Beach defences with liberal use of barbed wire. You can see the original shape of the ringstand is still in place even down to the entrance. Nr.1695 with a protected lid. The 5cm KwK L/60 with what looks like several hits on the back wall. It must have been pretty frightening to be manning the gun and receiving hits to the rear wall. The gun an L/60 has a very small field of fire just up and down the beach. When it was built it would only be an Nr.1695 open ringstand and then the rear wall and a roof was placed over the top to add extra protection. Hooks for a camouflage net. The area the gun could cover. My art work showing how it would have looked. 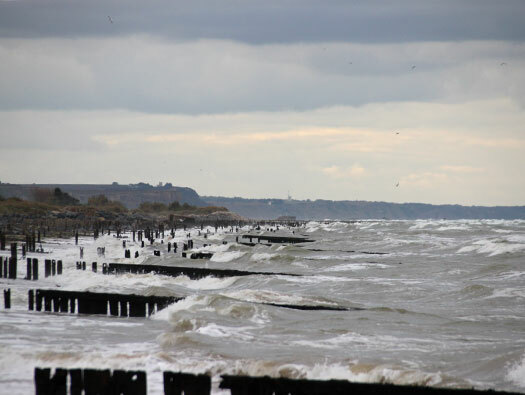 This picture looks like its after D-Day and the build up, there seems a lot of flotsam & jetsam cleared away. Another view west. 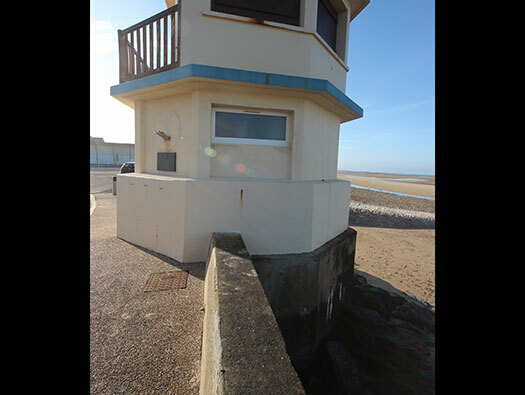 A beach lookout now. German horse artillery moving through Ver. Ringstand (2) where the lid has been removed now. The original guns ringstand base. 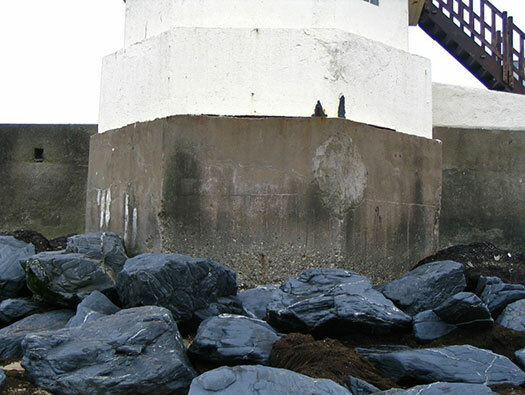 The The seaward side damaged but not destroyed by shell fire..
Allied intelligence plan of its construction. Sherman Firefly of the Royal Dragoon Guards in Normandy. 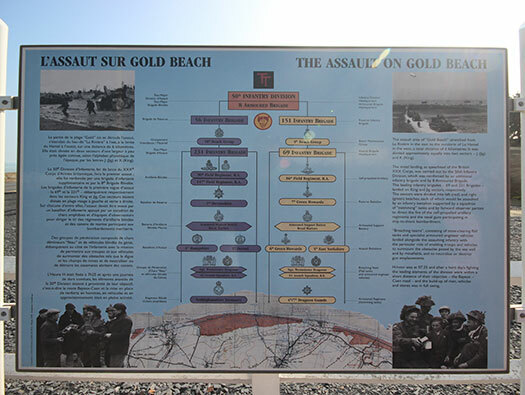 The assault on Gold Beach. 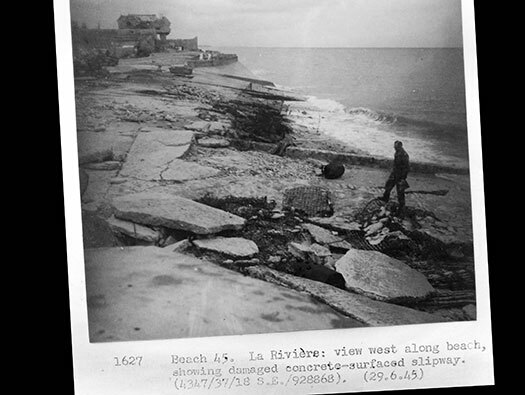 Wn33 Ver-sur-Mer Between the Nr.1694 ringstand (2) from the R669 casemate. Somewhere here was a observation/B.Stelle of some kind. 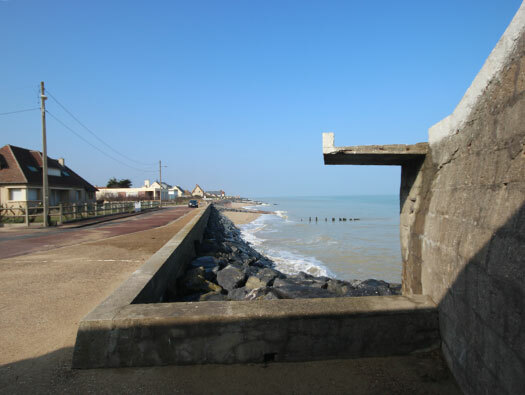 Part was used to view the sea and another for the air with the Fl.W.16.W.F.There were several Luftwaffe posts along the coast, to watch for Allied air activity and when the radars were down the human eye was the next best way of seeing air activity and reporting it to Flak, fighter and Civil Defence. 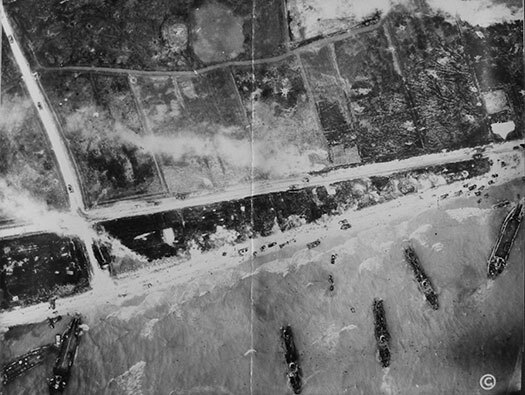 A fire controller in the B/Stelle could call artillery down on areas of the beach and inland by just calling for fire on say Muinz or Lutitch. These code words were used for beach targets and numbers for inland targets. 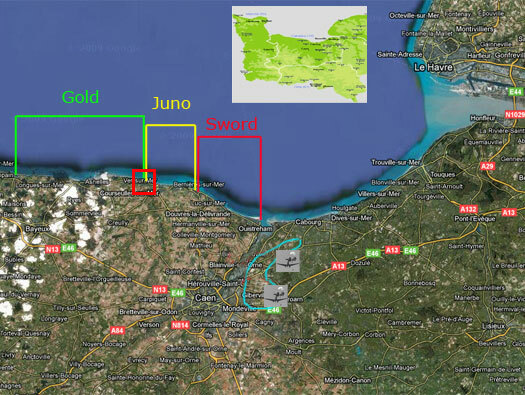 Artillery just inland could cover quite a large area of the coast. After artillery the next defence were mine fields. Here Mf.41 covered the left flank and Mf.72 covered the right flank. There were also many more smaller and also dummy mine fields.. There seem to have been two coloured mine field signs, one for a real mine field and the other for dummies. Plan of a Teller Mine. R669 Casemate passed the 5cm ringstand. 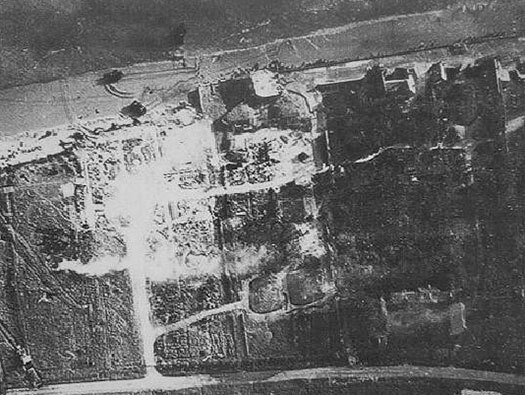 A 1947/1952 air photo of the R669 casemate showing what was left after the war and now the start of reconstruction. The two mounds are the Feldmässing with the Tobruk in front. There is a trench coming out of the back of the casemate. 8.8cm Pak 43/41 inside its casemate. Concrete block walls with steel reinforcement placed in between the walls and then filled with concrete. 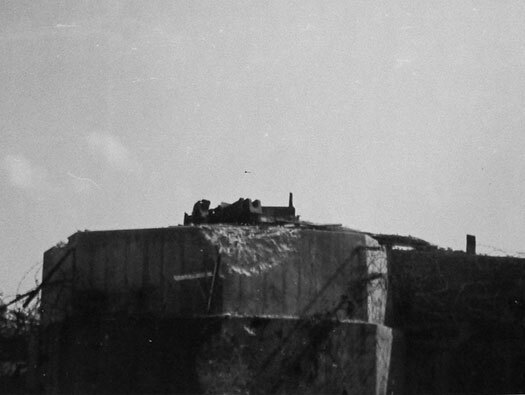 R669 Casemate picture taken 29 June 1945. 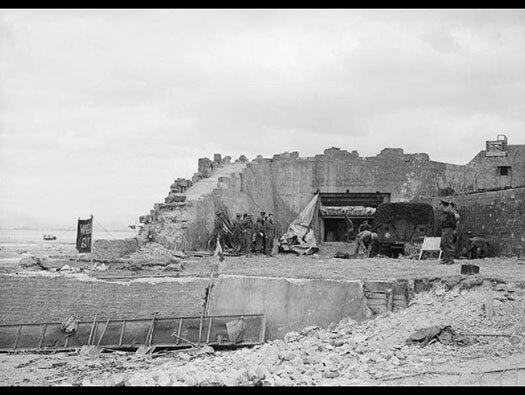 R669 Casemate possibly taken some time after D-Day when everything was being cleaned up. 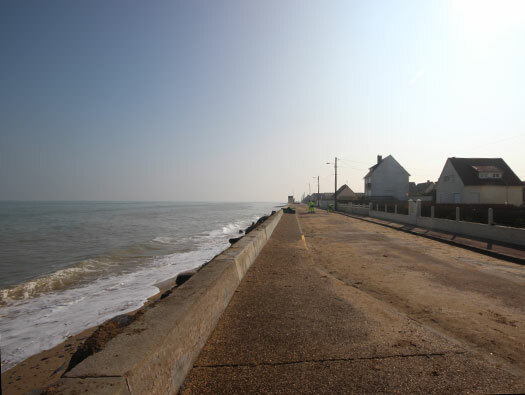 The seawall has been bashed about by the two tides a day smashing into it. How a rear door would look. Smoke extraction vent on the back of an R669 like this one. 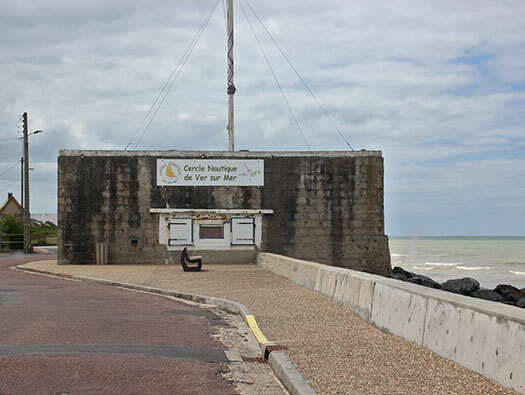 Wn33 Ver-sur-Mer R669 Casemate front view. 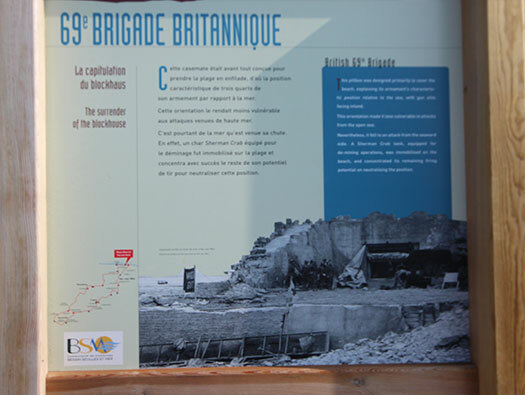 British troops used the casemate as a safe area to work on the beach after the initial landings. 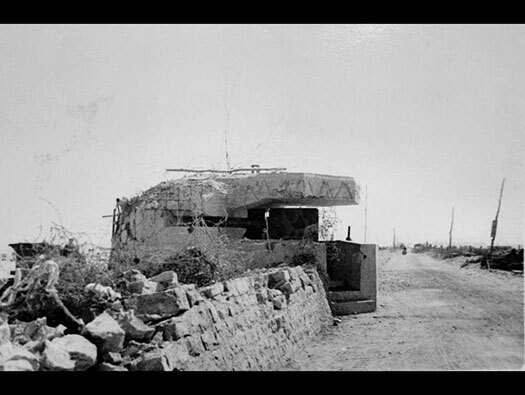 The original plan of an R669 casemate in white but this one had added concrete blocks placed around the outside and squared off to look like a house. Any member of the Beach Party (beach working parties) wore a white ring around their helmet, this denoted that they were Beach Party. If you did not have a white ring on your helmet you had to get off the beach as quick as possible. 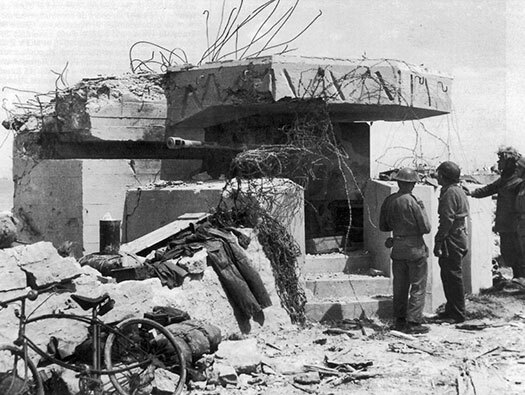 8.8cm Pak inside a bunker. 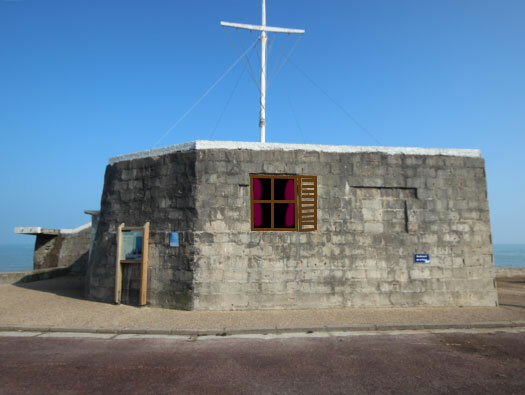 A closer look shows a house behind the casemate and a wooden lookout/fire control observatory. British beach party using the safety of the concrete as a HQ. 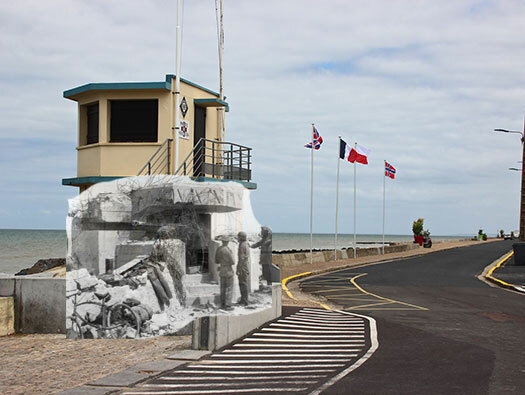 This picture shows after the British soldiers have cleaned up and are about to leave. ('British' covers both British and Canadian soldiers). Side view shows what look like windows, probably for camouflage reasons. I have added what I think they may have looked like. 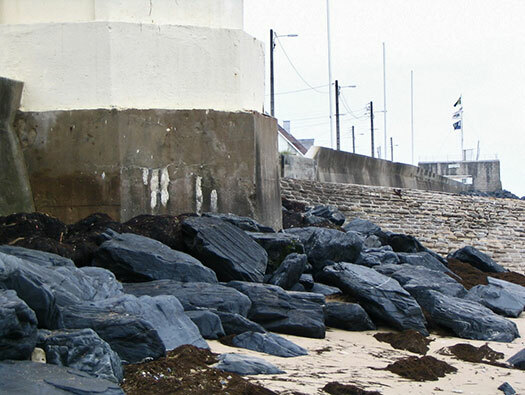 Bat-sur-Mer, Brittany with its painted windows. 8.8cm Pak 43/41 inside a casemate. Plan of this R669 casemate. 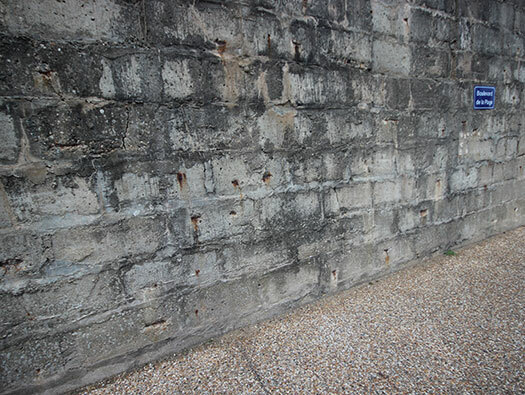 Extended strengthened flanking wall protecting the casemates embrasure from direct fire from the sea. This casemate was not designed for an 8.8cm Pak 43/41 so had to be slightly modified to allow such a large gun and a broad field of fire. 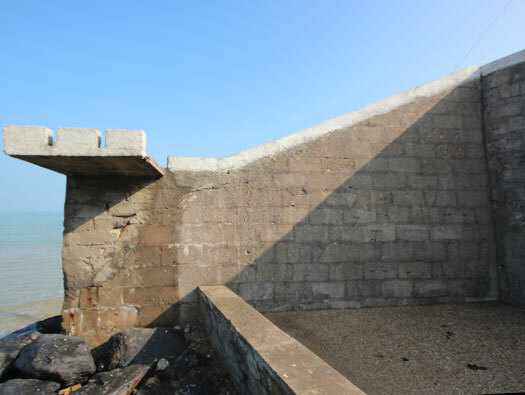 This casemate also has a flanking wall as well and that cut down the field of fire considerably but made the casemate a survivable bunker from ship to shore fire power. The view the gunners would have had. was very active for a short time, and pinned the assault to the beach. To the left of the R669 casemate was a Bf.58c Tobruk and two Feldmässig either ammunition or crew quarters for the 8.8cm Pak 43/41. 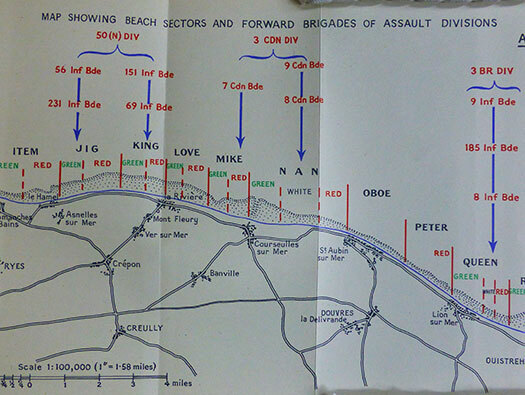 Allied COHQ Bulletin Y/36 Enemy Defences and Beach Obstacles. 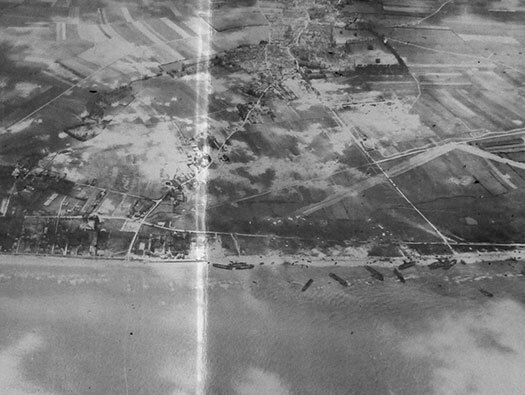 Wn33 Ver-sur-Mer The Allied plan of the area. The plan above King Beach and we are at King Beach, Red. D-Day +2 King Beach, Red. 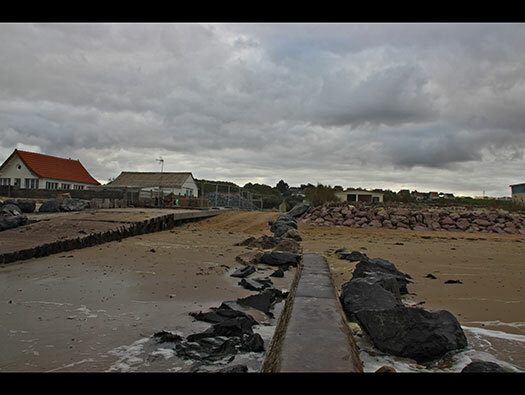 Wn33 Ver-sur-Mer King Beach, Red. 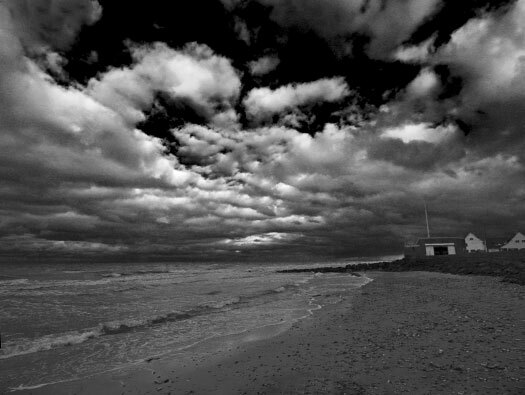 Looking towards King Beach Green. This is where the 6th Bat. Green Howards landed. Green Howards training on Operation Fabius. Wn33 Ver-sur-Mer Chemin de fer de Caen à la mer train stop. Sergeant Major Stan Hollis of the 6th Bat. 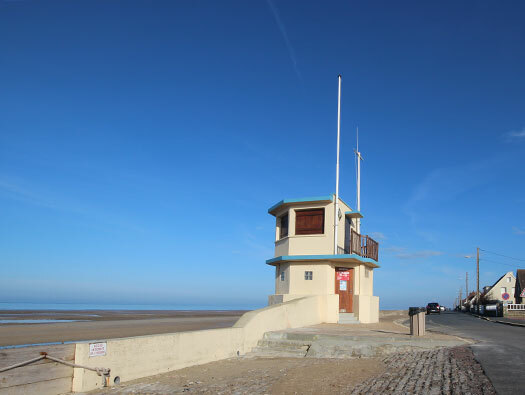 Green Howards, as he was landing at La Riviere "I lifted a stripped Lewis (machine gun) off the floor of the landing craft and I belted this thing with a full pan of ammunition. "It was then that I received the most painful wound I had in the whole war. I lifted the Lewis off and it was white hot. I got a bloody great blister across my hand - as big as my finger and very painful." Stan had studied the plans, maps, models and air photos of his allotted landing place in England at their D-Camp somewhere in the south of England and it just happened to be here at the old railway halt and a (what we would call today a bus shelter). In his mind it was a German strong point and needed to be taken out before they landed. Thus he 'liberally machine gunning a shelter'. 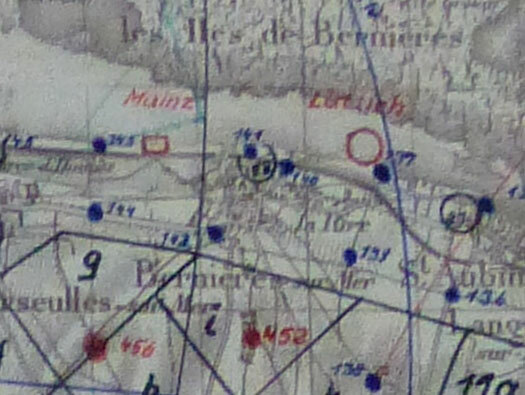 Plan of the railway line that passed through Ver-sur-Mer. An RN rating firing a Stripped Lewis Gun. The type of small landing craft that the Green Howards would have used. 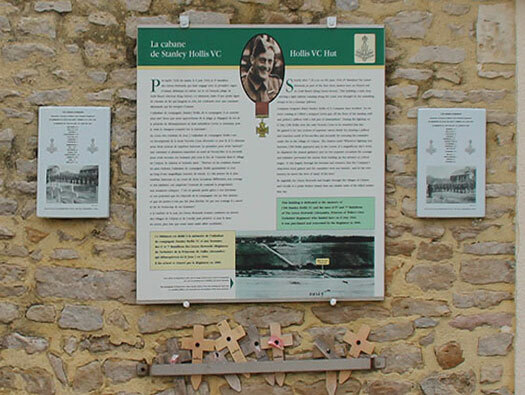 The details of RSM Stan Hollis on the side of the shelter. History of aviation - July 1, 1927. In 1927, the "fashionable" challenge for rash pilots is undoubtedly the crossing of the Atlantic. Everyone wants to put him on his list. Even after Lindbergh's exploit, there are always contenders for this long raid over the waters. On Wednesday, June 29, 1927, at 10:24 am, an additional crew, a candidate for the crossing, was deployed from New York, consisting of Commander Richard Byrd, Lieutenant Georges Noville, Bert Acosta and Bernard Balten, Navigator. They took a seat on a three-engine, the America, a F.VII-3m from Fokker. The crossing, funded by Mr. Wanemaker, will not be easy for the four men who will have to face very bad atmospheric conditions, the fog accompanying them from Newfoundland to France, where at first on the French coasts, they will be lost. 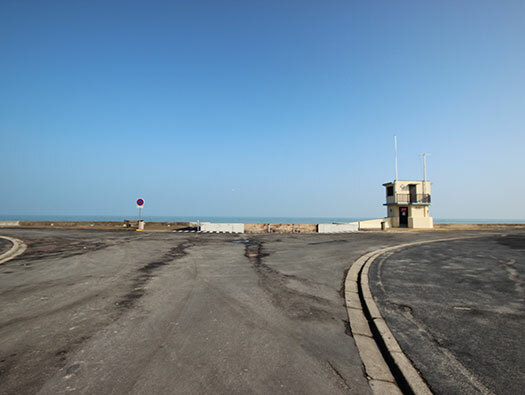 Not finding the way to Paris and short of gasoline, the crew will be forced to ditch at 2:30 am on July 1, 1927, not far from the beach of Ver-sur-Mer in Normandy. The plane is broken, but everyone is holy and safe. From Air Journal. Voie de la 50ème Division D´Infanterie, 50th (Northumbrian) Infantry Division Way. 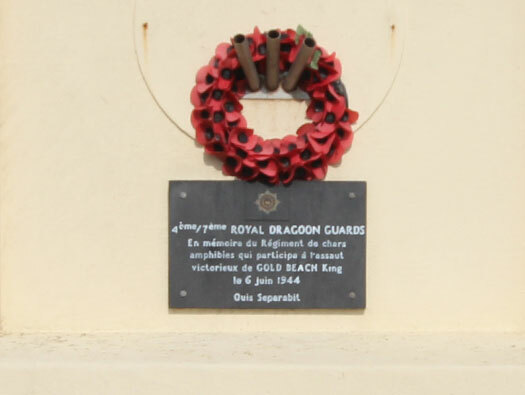 Wn33 Ver-sur-Mer 50th (Northumbrian) Infantry Division Way. An air photo of the road way. 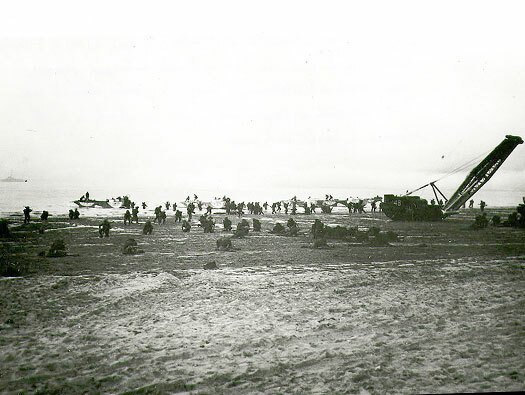 They are about to push into a very overcrowded beach and drop the two ramps for the infantry to walk down. 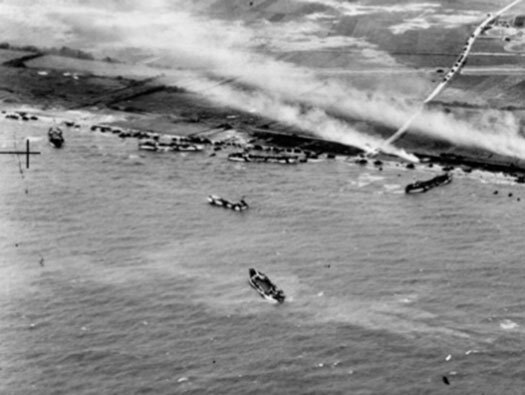 You can see here the ramps down in the water and the infantry (Commandos here) landing. 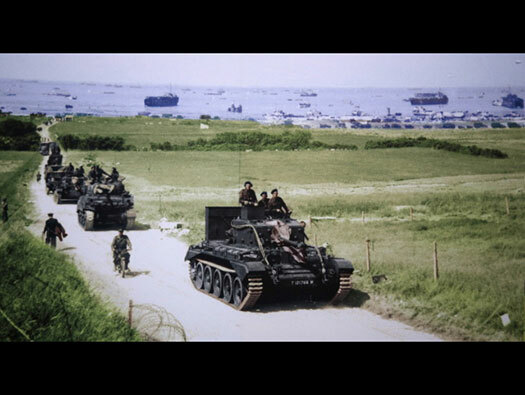 British Armour leaving the beach, this would be some time after D-Day as the area looks very safe. 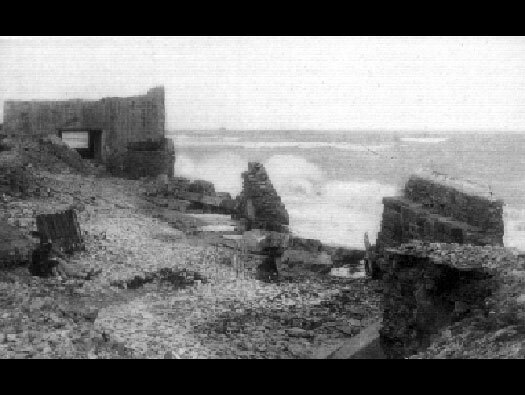 Wn33 Ver-sur-Mer The second wave landing. 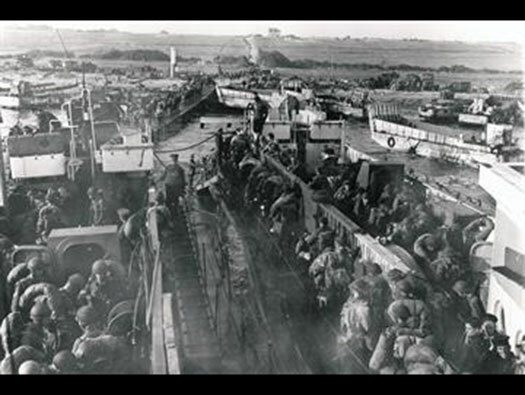 Infantry in assault landing craft and a Churchill bridge layer landing. 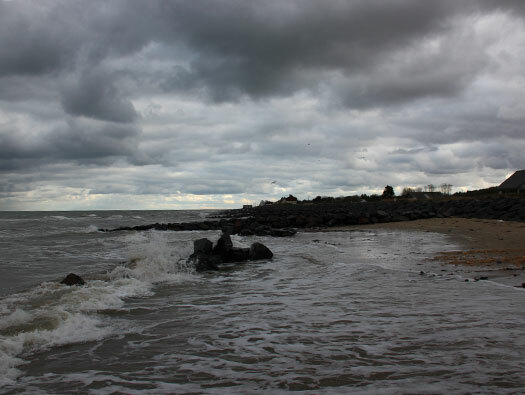 The first wave landed and went straight inland. 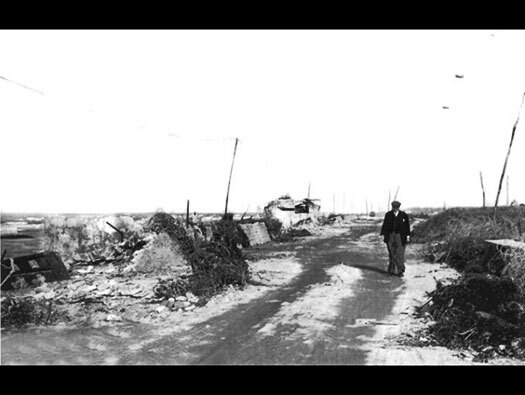 Just inland was an ant-tank ditch zig-zagging across the front of any advance so bridge layers were needed like the one in the main picture. Anti-tank ditch on Omaha Beach gives an idea what it would have looked like. 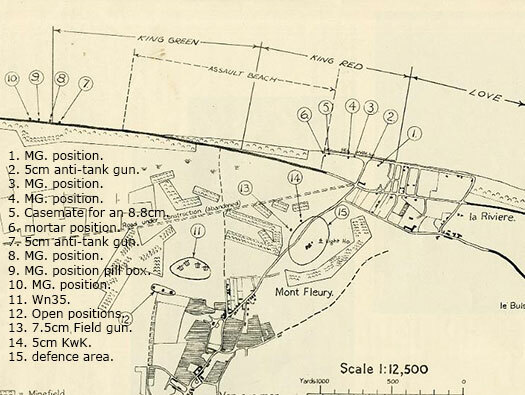 Anti-tank ditch cross section plan.